Aaron Durand has captured an incredible series of long-exposure night-time photographs that make speeding Caltrains in the San Francisco area look just like lasers! 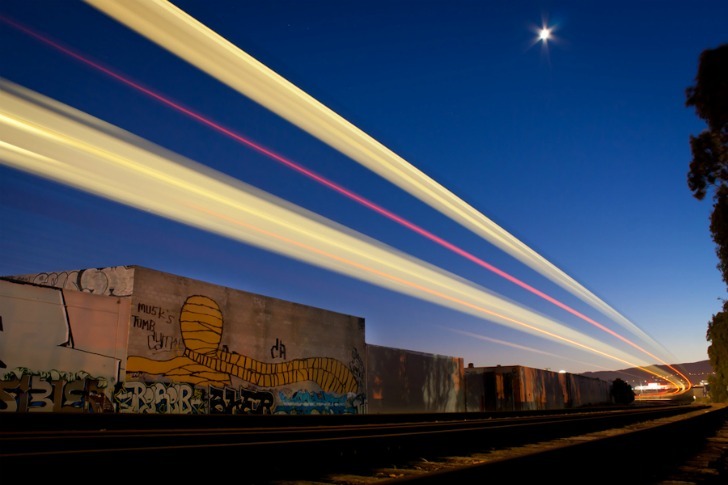 Durand has spent a lot of time shooting graffiti around the Bay Area at night, but he wanted to capture motion, so he pointed his camera towards the moving trains. The results are like a time-warp - as the trains speed by, Durand's camera absorbs the laser-like light beams in a beautiful moment that glorifies public transit. Durand and his friend Nick Fisher like to hang out near San Francisco Caltrain railways, which are also excellent venues to take pictures of graffiti. 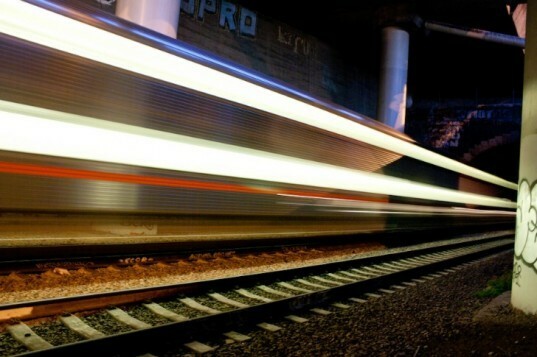 They patiently wait for the trains to speed by and hit the shutter for a long exposure to get these amazing images. Durand uses both digital and film, but as of late he’s been more interested in film and shoots with a German medium-format camera, the Pentacon Six. He and Fisher have even placed a camera on the tracks to get an amazing shot of a train passing overhead, which is portrayed as two red lights shooting out from the tunnel. The train-chasing photographer also works for Twitter and tweets as the everydaydude. You can see more of Durand’s photography at his website or on his Flickr page. Durand and his friend Nick Fisher like to hang out near San Francisco Caltrain railways. The railways are excellent venues to take pictures of graffiti. They patiently wait for the trains to speed by and hit the shutter for a long exposure to get these amazing images. Durand uses both digital and film, but as of late he's been more interested in film and shoots with a German medium-format camera, the Pentacon Six. Train passing below two bridges with graffiti in the background. Green train shooting out from a tunnel. Tripod set up and waiting for train to arrive. The classic corrugated metal exterior of this train is faintly visible in this image. Moon and building in background. Stitched panorama of a rail yard. He and Fisher have even placed a camera on the tracks to get an amazing shot of a train passing overhead, which is portrayed as two red lights shooting out from the tunnel. You can see more of Durand's photography at his website or on his Flickr page.